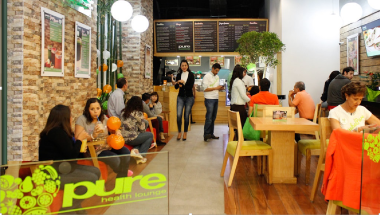 Pure Health restaurants are synonymous with healthiness and well-being. 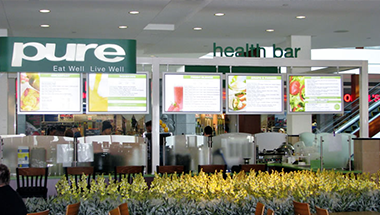 Pure Health food franchises are one of the healthiest fast food franchises for today’s health-conscious discerning consumers. 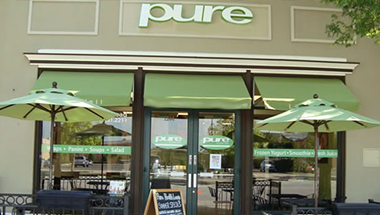 Pure Health features a delicious selection of protein bowls, sandwiches, wraps, paninis, salads and so forth. Every meal is made using our special oven that’s programed to ensure that each menu item meets our exacting standards. For 150-300 sq. ft. or 15 to 30 square meter spaces. model, and requires no seating. It’s suitable for areas with limited space and very high foot traffic like malls, airports or other transportation hubs. It requires low investment, and is suitable for co-branding with other foods and retail. Kiosks are installed in strategic locations to draw maximum customers. For 300-500 sq. ft. or 30 to 500 square meter Bars are suitable for areas with high foot traffic like mall food courts or street fronts. The seating capacity may be limited or shared with other restaurants. Kiosks are installed in strategic locations to draw maximum customers.